From the moment we all started watching the series we fell in love, with the characters, the clothes, the interiors, the Mad Men style. Mid-Century Modern interiors happen to be one of my favorite styles to design, to look at, and the style I have chosen for my own home. And believe me it is hard to pick what style you want your own home to be when you are a designer. You see everything and want everything, but ultimately there is an updated mid-century vibe going on in my home and I am pretty sure I want to keep it that way. I bet that after watching the final episodes of Mad Men there will be many more of you desperate to get your hands on some great Mid-Century finds. Which brings me to today’s post. We can search online to our hearts content to find lists, tips, and inspirational images telling us how we can achieve the Mad Men style on our own, but where do people find those great pieces, those one of a kind finds and great deals that you always wish you could find, but never do? 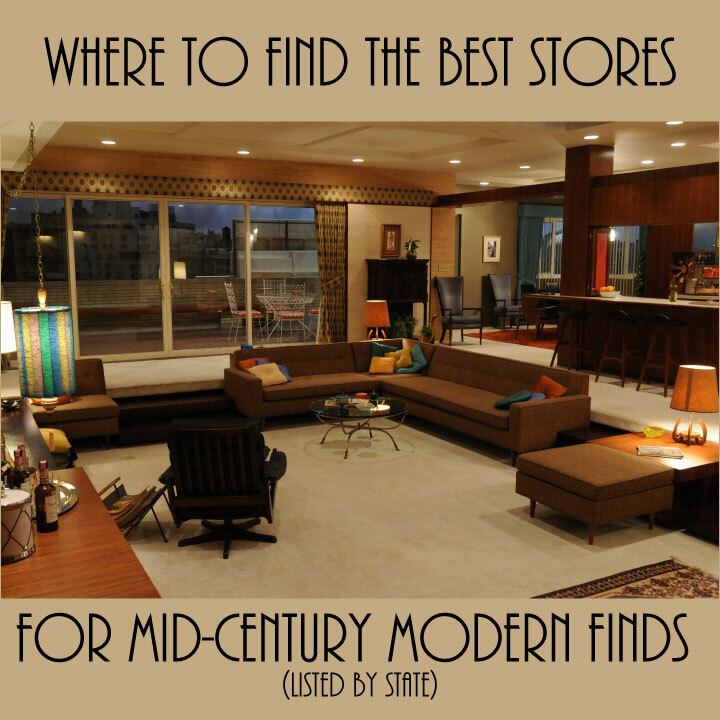 Each city, in each state has its own hidden gems and great place to find Mid-Century furniture. I would like to start an ongoing list that you all can reference to find the best places to find that Mad Men style by state. I will start the list today by adding my favorite spots from my home state. It is up to the rest of you to help fill in the blanks and share your favorite spots for your own cities. Leave comments, send emails (you can find our email on our about page), or contact us via Facebook. We want to make this a great resource for everyone to use no matter where they live. It will also help me to know what stores to check out whenever I am visiting your hometown!